Ahmed Badry and co-workers have recently published a review of the scorpion fauna of Egypt. A total of 35 species belonging to four families are reported, of which 6 are endemic to Egypt. The article has an identification guide for the Egyptian taxa. The article also has interesting information about the different species' habitat preferences. There is a supplement to the article on the article homepage with location information and color pictures of most of the species reported from Egypt. country and in view of recent revisionary systematics. 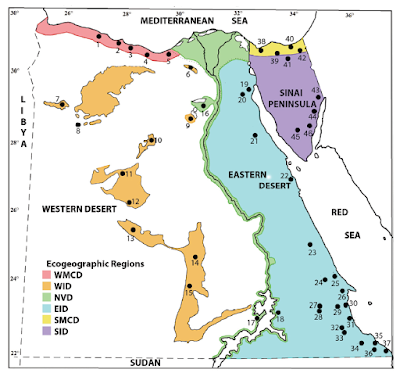 We assessed the validity of listed records in light of new taxonomic findings and geographic distribution data and present a new list and an identification key to the scorpion fauna of Egypt consisting of 31 species, 18 of which were collected during this survey. Four species were not accepted for the list because no voucher material was available. Thanks to Dr. Ahmed Badry for sending me their article!